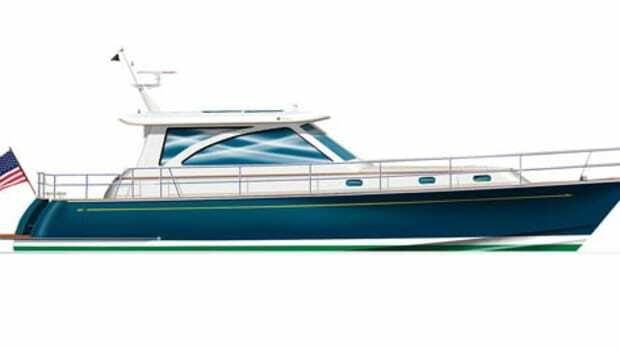 Got concerns about having a full-fledged, semi-custom boat built? Hunt Yachts packs stacks of fun and satisfaction into the adventure. The term “semi-custom” gets tossed around a lot these days, especially by marine journalists. We use the term to describe virtually every sort of boat, from fully optioned runabouts to behemoths with alternative propulsion packages, modifiable layouts, individualized décors, and a veritable slew of other combinations and permutations for prospective purchasers to play with. 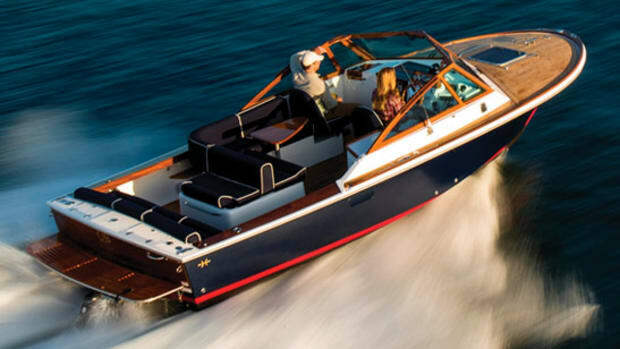 Whether spec’ed-out center consoles, motoryachts with custom soft-goods packages, and teetotally trick bowriders all strictly qualify for semi-custom status is a matter of personal opinion I guess. 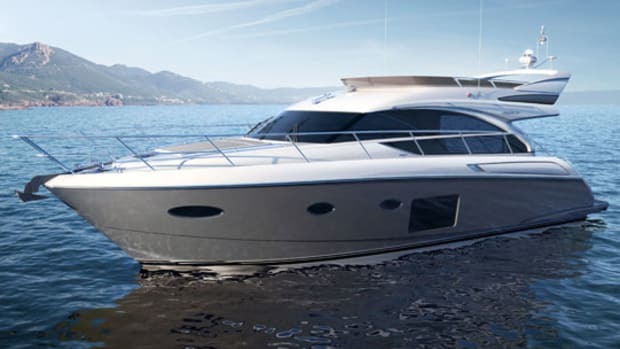 But, regardless of how you splice it, there’s no question that such watercraft are literally worlds away from a serious, semi-custom vessel like the Hunt 52 Express Motoryacht shown here. 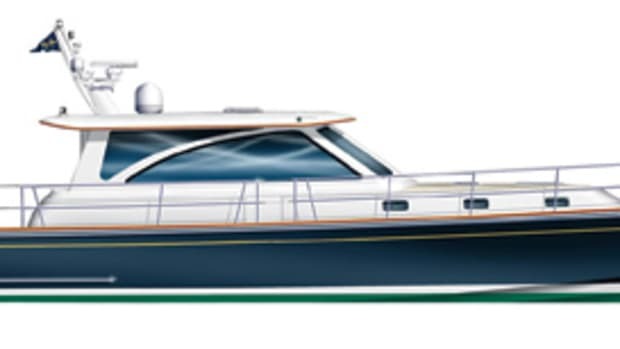 Hunt Yachts specializes in semi-custom builds, of course. 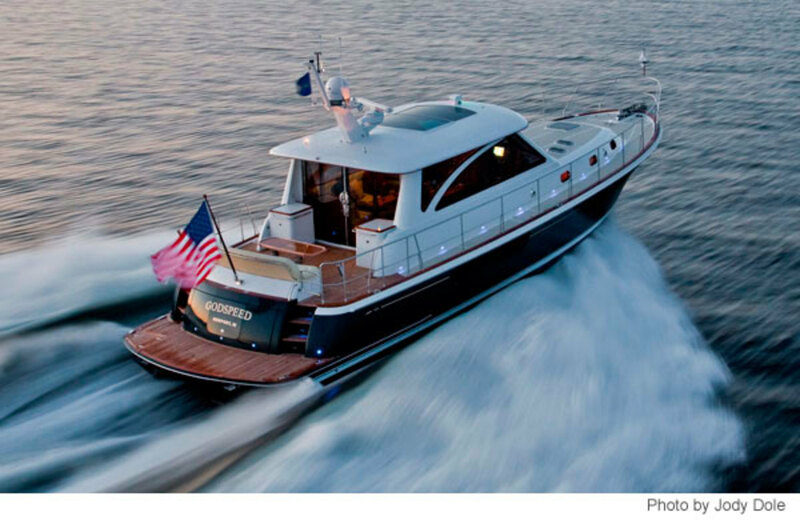 Thanks to its long-standing and synergistic relationship with the fabled naval architecture firm of C. Raymond Hunt Associates of New Bedford, Massachusetts, the venerable little Rhode Island-based company is commonly and routinely acknowledged for its semi-custom capabilities. Indeed, a quartet of owners I recently interviewed, some deep into a semi-custom project, others currently enjoying the results of one, all seem to agree—Hunt Yachts is a semi-custom top-shelfer with a can-do, pull-out-all-the-stops attitude. The changes G speaks of were significant, and precisely coordinated with Global Yacht Builders, the Taiwanese yard that Hunt uses for big-boat construction. On the mechanical front, Volvo Penta IPS pods were substituted for the straight-shaft-inboards that are standard issue on the 52, a swap that necessitated the relocation of tankage, the reconfiguration of internal strengtheners, and the installation of special IPS mounting collars with the extra laminates Volvo demands. Additionally, to nix noise in the accommodation spaces, some air-conditioning componentry was relocated to the heavily sound-insulated engine room. 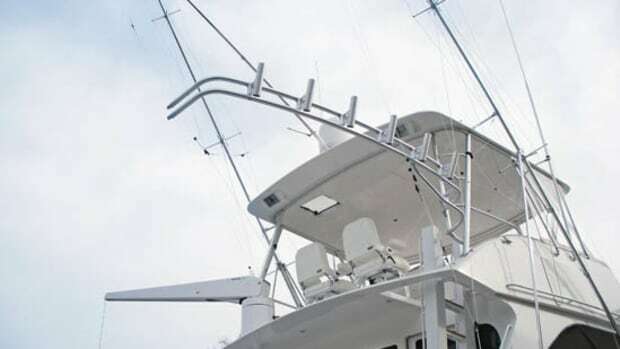 To keep the boat’s nether areas bone dry and odor free, an Arid Bilge System was installed. And to facilitate oil changes from outside the engine room, the oil-change system was re-plumbed and conveniently installed just below the ER’s cockpit hatch. 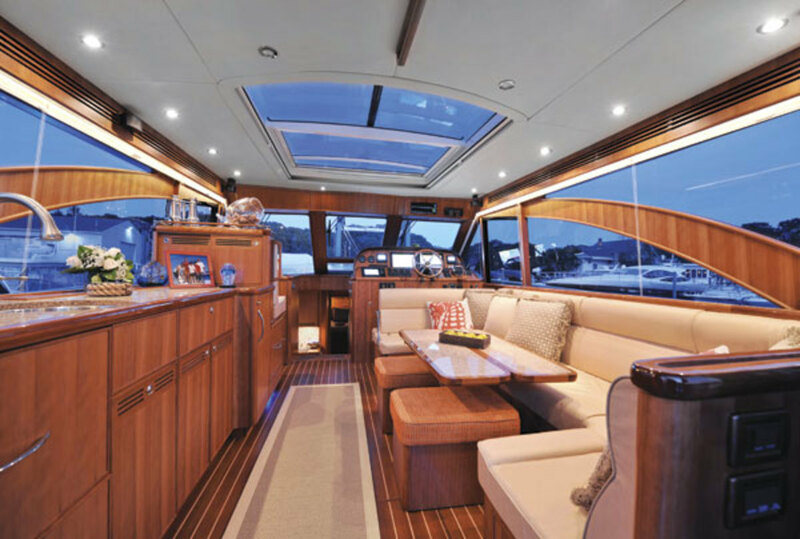 Changes to the boat’s interior were almost as dramatic as what was done mechanically. With an assist from the Hunt Associates engineers and designers in New Bedford, the yard enlarged the saloon by moving some bulkheads and then seriously (albeit subtly) reconfiguring the saloon’s furniture. Also, the helm was significantly widened to accommodate extra electronics, a modification that called for challenging alterations to the companionway opening and stairway leading belowdecks; the galley was outfitted with a big four-burner stove (with full oven), extra refrigerator/freezers, and custom granite countertops; and an extra stateroom was added to the rear of the accommodation area, thanks to IPS-related space savings. Not so coincidentally perhaps, Hendricks worked as an outpatient psychiatric counselor before he began a highly successful career in yacht sales some three decades ago. Over the ensuing years, he’s come to see himself as an adviser or counselor more than a sales person, with precise, detail-oriented communication (amongst himself, his clients, Hunt’s designers and engineers, and whichever yard’s involved) being the primary objective. And he’s also seen a phenomenon of sorts develop with the passage of time that makes his job both a bit more interesting and a bit more complex. Hendricks considers it his duty to emphasize resale value with his customers as well, whether they’re old salts, newbies, or somewhere in between. 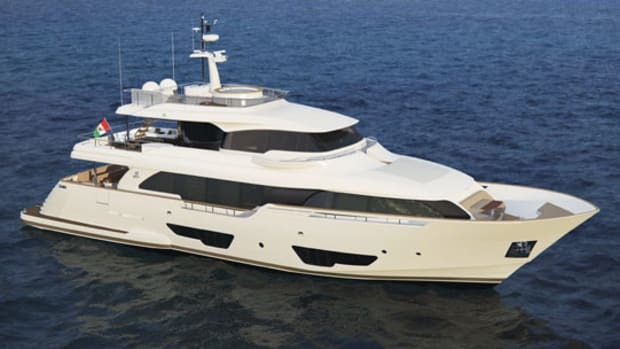 The 44 Express Motoryacht that’s currently abuilding for a couple of highly experienced Florida-based boaters, Barbara and Franklin Carson, nicely illustrates the point. When the Carsons first came to Hendricks, they’d decided to downsize from a 52-footer to boost manageability. But they also wanted a super-large master with an en suite head, a super-large shower stall, and a raft of other appointments that would facilitate cruising long distances by themselves. Interest in resale value? Negligible! A modification to one of the 44’s two standard layouts was what Hendricks finally sold to the Carsons. After nixing one head, the modification split the other into two halves port and starboard, one with a giant shower stall and the other with an MSD and sink. Then, across from an ample galley (and in keeping with the couple’s need to stay abreast of business affairs while cruising even after their retirement), it substituted for the standard second stateroom a much-customized office/lounge space, with a nifty convertible berth. Let’s Hear It for the Engineers! The statement’s true in the extreme. C. Raymond Hunt Associates is a naval architectural powerhouse with a worldwide reputation, especially for the high-deadrise, exceptionally seaworthy running surfaces patented by C. Raymond (Ray) Hunt in the late 1950s and today called the Hunt Deep-V. Not only does Hunt Associates formulate virtually all the design and engineering solutions for Hunt Yachts, it does considerable design work for a bunch of other recreational builders including Regal Boats, Grand Banks, Southport, and Grady-White. 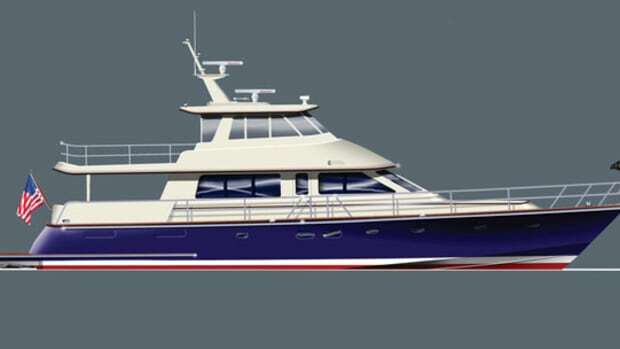 And even more significantly perhaps, Hunt Associates supplies and licenses designs for pilot boats, ferries, and other commercial, military, and law-enforcement watercraft, a state of affairs that benefits buyers of Hunt’s semi-custom yachts big time. 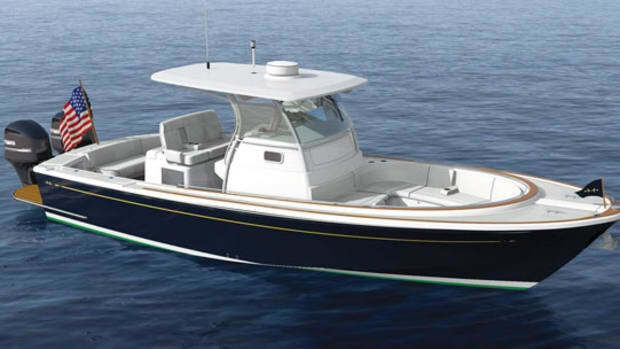 There’s one last enticement Hunt Yachts offers the buyers of its larger semi-custom models—a Carefree Purchase Program with two-year warranty assurance, a free two-year BoatU.S. 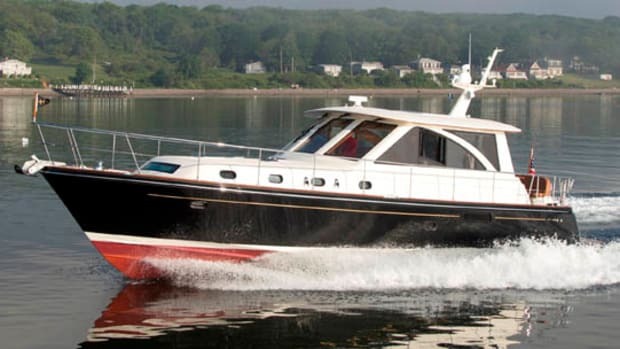 membership (with the full towing package), VesselVanguard (with digital maintenance schedule, and alert and log service), and, last but not least, lots of operational and technical training, a feature that, for Mr. and Mrs. G and their new 52 Express Motoryacht, has transformed a relationship that was once all business into a lively, boaty friendship.